The ton class; recent picture of SAS Durban has made me wonder how many are floating still. Museaum ship, laid up, mothballed. not sure the correct term. From the two pictures ive found of Durban, she doesnt look like she has mooved in a long time. From what ive found on the US laid up vessels, they seem to be on a floating barch. I am only wondering because, like the purchase of the A109, and now looking to redifine their role, will the new OPV really be able to carry out the duties of MCM, or will SAN need a designated MCM. I know technoligy allows uav and other new things. But incase, are they current riverclass able to be mothballed too. I mean, I read that Protea still has many years of service left in her. I understand that wood rots, but why would a Navy allow it (Durban) rot away? To me, It would be better served to donate these vessels to a Coast guard unit rather than letting them die. That includes the river class once biro comes into effect. The SAS Durban was stricken from navy charge many, many years ago - the South African Navy no longer has any rights over or responsibilities towards her. He current owners do. Mine countermeasures, broadly, fall into two sections - contact mines and influence mines. Contact mines are difficult for whoever wishes to lay them. The bit with horns that bobs about in the movies is only half of a contact mine. 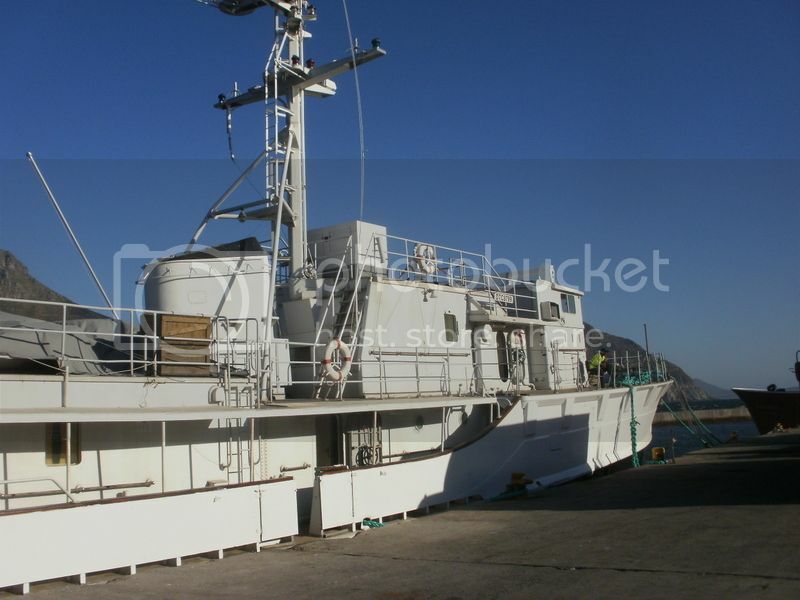 A fairly substantial vessel, fitted with minelaying rails, is needed. 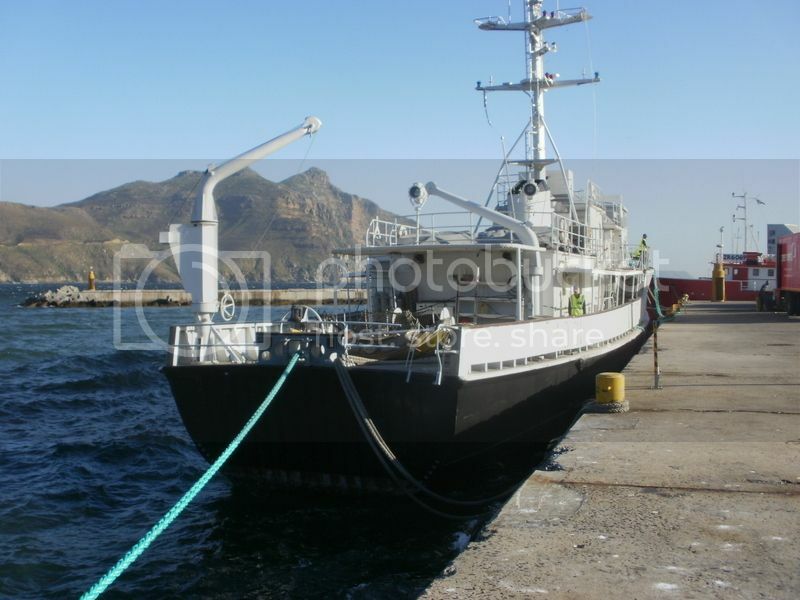 South Africa's best defence is to identify such vessels and prevent them closing to areas where minelaying is possible. Failing that any stern trawler makes an excellent minesweeper - it already has onboard a powerful winch, it's crew is adept at handling otterboards and the extra sweep gear can be fitted rapidly should it ever become necessary. Influence mines are also a problem - much easier to lay and air-droppable but the South African coast affords few places where they can be laid. Modern influence mines have things such as ship count, ship identity, multiple sensors and some even dig themselves into the sandy bottom. The old jackhammer in a barrel (acoustic mines) or electro-magnetic pulses no longer work with them. In fact by the end of WW2 they were no longer working. The modern mine ignores all the old traditional methods of sweeping. It is sensitive enough to explode only when "worthwhile" targets go over it. Defence against influence mines consists of identifying the mine. Today's minehunting sonar with all it's ancillary gear will fit in the boot of your car. In fact the T-craft did a lot of test runs with such multi-frequency minehunting sonars. They can be towed at a fairly high speed and will identify individual rivets on a mine (in the unlikely even the mine should have rivets). A mini-PAP is not much bigger than a 30cm torpedo - it is capable of going down to the mine, using TV cameras to give the ships a positive ID and place an explosive charge on the mine. This charge, fired either by remote control or timer will neutralize the mine. If push comes to shove a diver can replace the PAP. It is a little outre to have a ship dedicated just to mine countermeasures these days. The minesweeper - once all those still currently in service worldwide are scrapped - will probably not be replaced. OPVs and IPVs will take on this function. What has made the revolution in minehunting sonars possible in the last decade is oodles of processing power which was not available before. A modern multi-frequency sonar - the one I am familiar with - will use up to 90 gigabytes a second. It gives a "picture" of the seabed that is almost as if a close-up camera took it. One defence, and one the navy has had the facilities for for the last 6 or seven years, is to do regular scans of likely places - like harbours - on a daily (or more often) basis. The computers instantly then pick up anomalies comparing the most recent scan with previous ones - and these can then be treated as mines until shown to be otherwise. The system was extensively used in our harbours during the FIFA world cup. The whole box-and-dice fits in a small motorboat (even smaller than a Namacurra). As to the Protea - she is old. I saw her arrive, brand new, as a raw recruit. I should be on the scrap heap - let alone her! She has had major rebuilds - her engines were replaced some time back with MTUs - but ships are complex things and the older they are the more often small annoying things break down. Valves fail to work, pipes fail, etc.etc. A refit that would replace all the functioning items would cost more than a new ship. So why indulge - buy a new ship! As an addendum - I had to go and look it up (alzheimers and all that) but in the early 1980's Honeywell already offered a PAP with add-on bolt cutters on the front. Thus one's minehunter could deal with moored contact mines at almost no extra cost. Get the mine in the sonar beam, down goes the PAP, snips off the cable and the mine pops to the surface to provide naval gunners with a chance of showing how badly they shoot. Thank you. very educational. I love reading this stuff! The idea is not to explode the mine - which could be a disaster to the minesweeper - but to hole the sphere so that it sinks to the bottom. Inevitably some fool hits one of the Hertz horns and it explodes - and if it's too close to the ship damage and injuries result. Now you try this for a lark - on a small bobbing trawler-sized ship you shoot, with a .303 rifle, at a sphere 3 foot (1 metre) in diameter of which about a third is above the water - and also bobbing up and down - at about 300 metres distant and see just how good your marksmanship is. With a bottle from the captain waiting if you explode the thing. 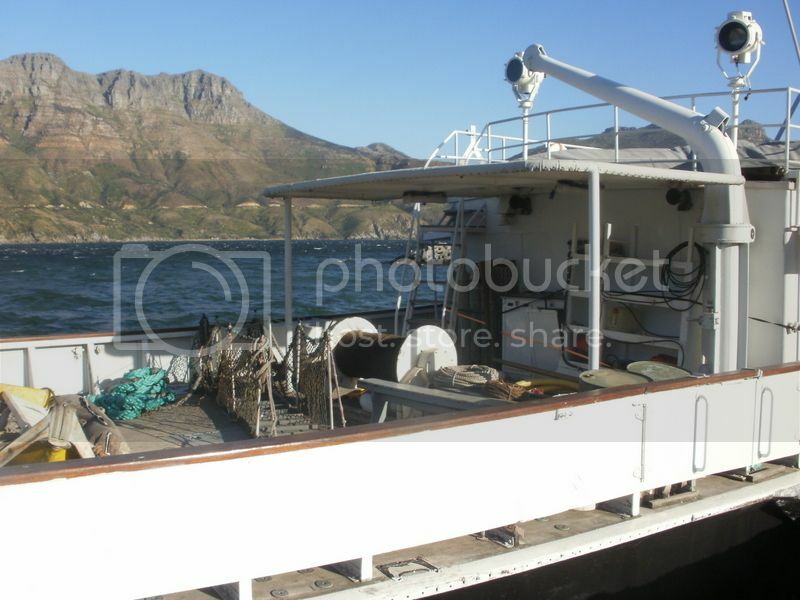 One has arrived in Hout Bay this morning, not to sure if it was under its own power or towed in as at about 3 am there sounded like a big ships horn going off, I will try and get a photo tomorrow but the only identification in the DTC8799 plate, no name on hull or life rings, black hull, white upper works. Here we go,the wind was pumping tonight. Crew of Security Guards, looks like she could have been used for a film set, lots of wooden boxes been off loaded in to two trucks, you can just see one truck on the right, some of the boxes are on the second photo next to the funnel. dose not look well maintained. t. Crew of Security Guards, looks like she could have been used for a film set, lots of wooden boxes been off loaded in to two trucks, you can just see one truck on the right, some of the boxes are on the second photo next to the funnel. dose not look well maintained. Great photos you've posted there Richard. Thanks....it is good to see the unfolding history of these ships. I'm sure there must be a lot of interest in Germany as to how they are now being used. Pity about those that were cut up and scrapped. Also looks like you've had a lot less wind in Hout Bay as well. A photo was posted on Sunday on the Facebook group SHIPS AND SOUTH AFRICA of this one being towed out of Table Bay Harbour on Sunday morning. According to the comments she is being used as a stand-in for Calypso in a documentary/movie being made locally about Jacques Cousteau. Doug the wind was pumping like anything in the afternoon, thought the wind was going to blow the door off when I got out! Wide awake thanks for that info about Calypso, yes definitely a film set today as the end of eastern breakwater turned into a market. 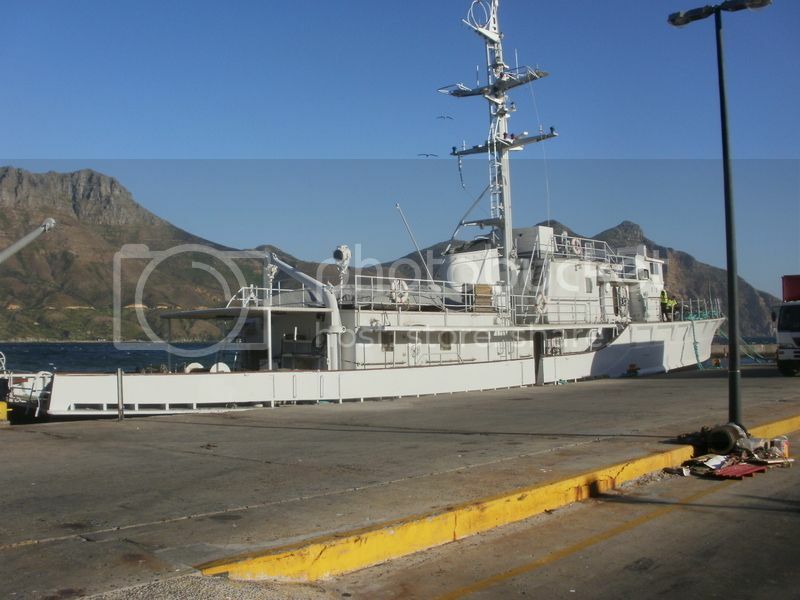 Maybe that's Grey Fox ex SAS Thekweni that was in the container port.